I loved everyone in our group of nine, but Adrienne has to be my favorite. Everyone was there in London to learn more about theater costuming and historical clothing, but Adrienne and I were passionate about the subject in serious way. 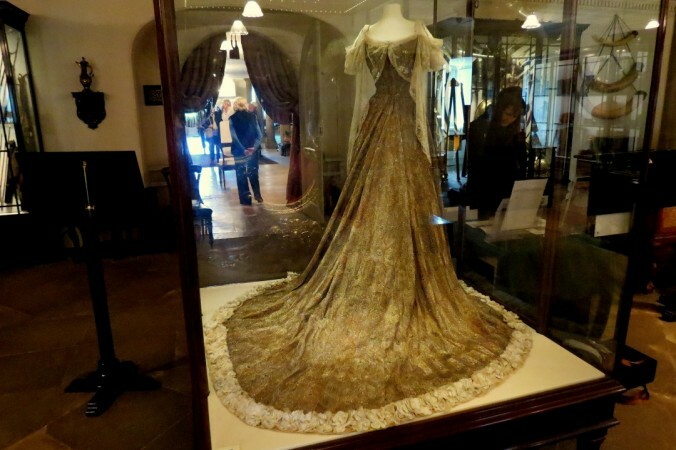 At least once we both threw ourselves on a museum floor to look at the insides of an eighteenth century gown. We got in numerous animated discussions standing in front of paintings, conjecturing at the structure of clothes. One day she told me “I e-mailed Cathy Hay. She’d love some help.” I think I made some kind of high pitched noise. Cathy Hay is famous in costuming circles for running a subscriber website that is a compendium of historical sewing knowledge, as well as for her ambitious projects. Her latest effort is a reproduction of a 1902 Worth dress that is encrusted in silver and goldwork embroidery. It had started as an inventive for a fundraiser to help victims of the Haiti Earthquake, but Cathy quickly realized that it would be impossible to finish the dress in any reasonable amount of time by herself, and at that point in time, she had blown out her wrists embroidering. Adrienne and I picked a day to go and booked train tickets to Nottingham. We were both nervous and excited to not only meet an idol of ours, but to help on this project we had watched come together through Cathy’s blog. An hour’s travel through London, three hours on the train, and an additional hour on public transportation through to the suburbs of Nottingham and we arrived at a parking lot where Cathy picked us up. She greeted us warmly and thrust bottles of water at us, which I thought was very thoughtful. On the car ride to her house, we managed to not make fools of ourselves. She introduced us to her cats, and her partner Demi and then showed up pictures of the original dress and we discussed how it might be constructed. Then she took us into her workroom and showed us her project. I had seem bit she had finished online, but it looked much smaller in person. And so much shinier. It was then I realized how much of an undertaking this project really was. I may or may not have squealed “Oh my gosh it’s real! Can I touch it? I’m gonna touch it.” Cathy probably thought I was insane. Then she gave us a demonstration the embroidery process. It was much simpler than I had feared. (This is the point where I admit that I have no patience for embroidery, but I really wanted to get up close to this dress.) Adrienne and I set to work for a couple hours. Cathy made us take breaks, as well as feeding us dinner. She told us about how weird it was to be famous in certain contexts, when she herself felt incredibly ordinary and like she was just doing the things that excited her. I think it was then that I realized how accessible the famous and extraordinary can be. They’re just people, pursuing their passions. Cathy and Demi took us back to the train station, hugged us goodbye and promised to keep in touch. Adrienne and I arrive back in London close to Midnight on that Sunday, completely excited and satisfied. Two or three weeks ago, Cathy formally announced plans to send parts of the dress worldwide, so that it could be completed that much faster. I’m absolutely going to help.